My Wandering Life: Tooth Fairy Time! Ben has had a wiggly tooth on the bottom front for at least a year now. And recently we noticed an additional visitor in his mouth... his first permanent tooth, poking through behind the wiggly baby one! Oh me, oh my, Ben is becoming a big boy. I personally cannot handle wiggly teeth. When presented with one, I instantly grow week in the knees while all blood rushes from my head and I have to sit down and breathe in a paper bag. Who knew? I can handle blood, shots, IV's, vomit, slimy green noses and all manner of other disgusting bodily fluids. But a teeny-tiny, itty-bitty baby tooth wiggling around and I hit the floor with no warning. Hopefully the wiggly one will come out soon. Hopefully I'm not there to witness it. The funny thing is that Benjamin has told me all about the Tooth Fairy. It's a girl, Mom, she comes and leaves money under your pillow for your tooth-ess when they come out! Does she now? Silly kid! Where do they hear these things? We've never had the Tooth Fairy (or Santa Claus or the Easter Bunny for that matter) visit our house, yet my boys are experts! We'll have to figure something out, and from the looks of things - soon! Isn't that weird how that works - Naomi had a tooth do the same thing. It was almost in when the other fell out. 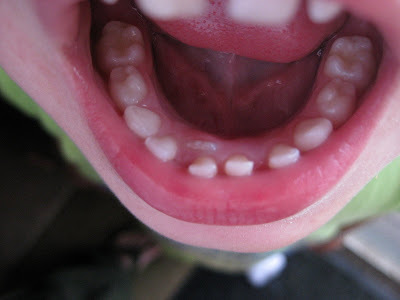 It took a looooong time compared to the others that push up under the baby tooth! I owe you a long email, don't I? Just last week, Emma found her first (barely) wiggly tooth. Looks like Ben will loose his before Emma.